School is out for the semester for this old dog and am finally posting my tutorial on how I made a single Tervigon/Tyrranofex interchangeable so that I can get the most out of this expensive model. 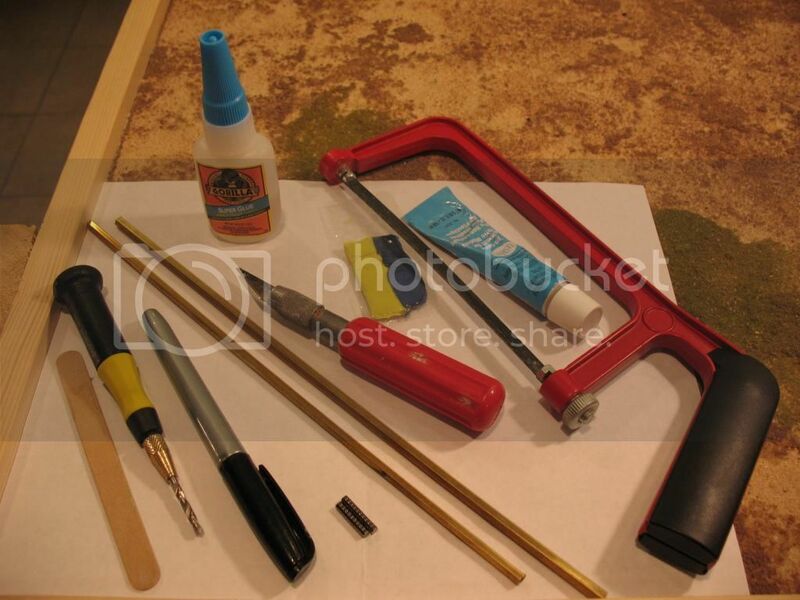 Lets start with a picture of supplies utilized. You will notice that I use hex shaped brass tubing, I do this as it accommodates a drilled hole quite well and when the two sizes slide into each other they will not turn on themselves like round tubing would. 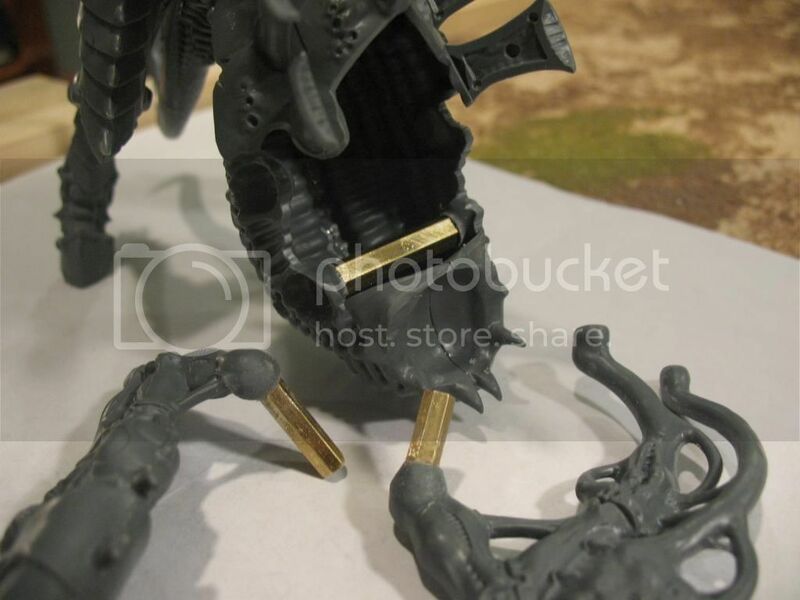 I don't use magnets in this case because the weight of the weapons will allow the guns and Talons to rotate and drag on the gaming table messing up your paint job. Now we shall start with the easiest part of assembling the torso, legs, and top spine. 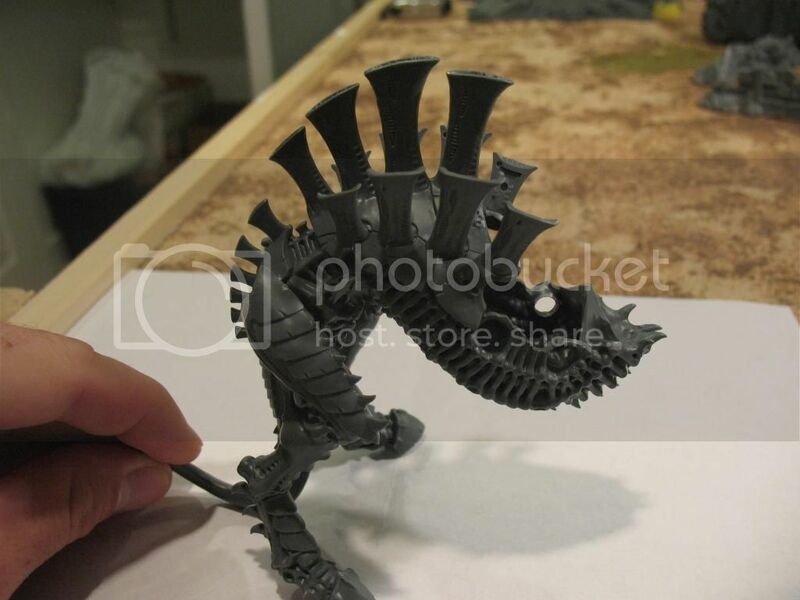 Do not glue on the carapace, stinger salvo, cluster spine (or whatever it is appropriately called) until the entire conversion is complete!!! Let's start with the easiest part, the magnetizing of the Sac. Should be self explanatory, consisting of N52 rare earth magnets (the strongest available), green stuff, and zap a gap glue for extra security. Use a sharpie to mark the location of where you intend to strategically mount the magnets. Test fit the location numerous times and ensure that the magnets will not hinder the sac from clamping to the underside of the Tervigon torso. There is a large enough gap at the thickest part of the sac and a single larger magnet should be sufficient but I didn't have any. Just another view of the magnets after they have been mounted. 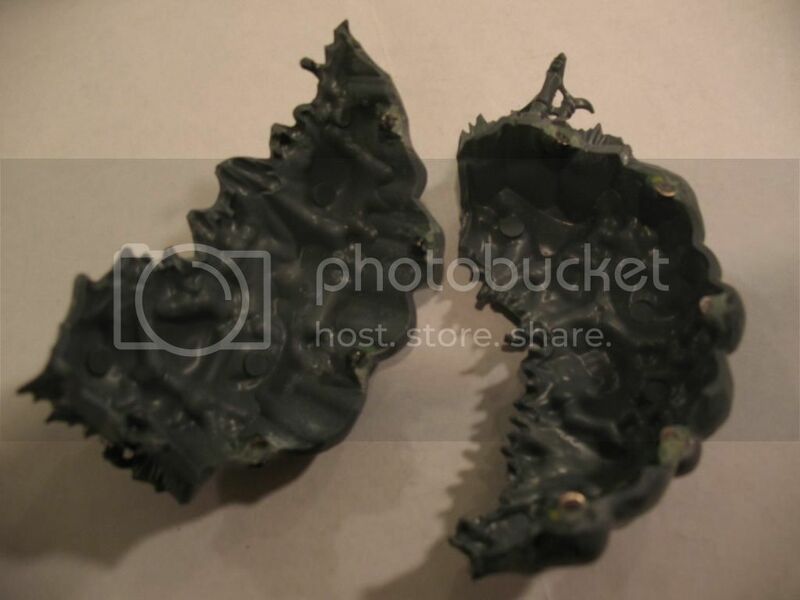 Be sure to wait a sufficient amount of time prior to fitting the two lateral sides of the sac together as it is not a good thing for your magnets to become dislodged prior to the curing of the green stuff and glue. 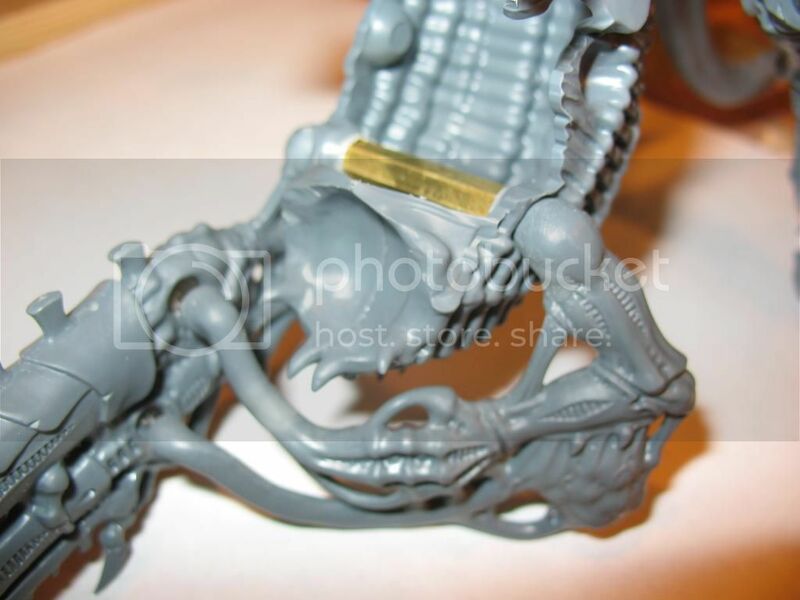 After the curing of the glue and green stuff you should be able to clamp/clasp the sac on the abdomen of the Tervigon, GW did a great design in allowing us to be able to do this. The next step is to glue the two Termagants to the opening of the sac, glue only ONE side of the sac to the Termagant! I chose the anatomically correct right sided sac as it had a larger gluing surface. Now it is time for the more difficult part and requires patience and lots of test fitting! I drilled into the arms of the weapons, including the scything talons (not shown) and the Rupture Cannon. This can be done to all weapon options. I cut certain lengths of the smaller diameter brass hex tubing and glued them into the holes. The larger diameter brass hex tubing goes into the holes drilled into the front most arm sockets as shown above. These will slide into each other. Again, I cannot emphasize enough that this take a lot of patience and test fitting! 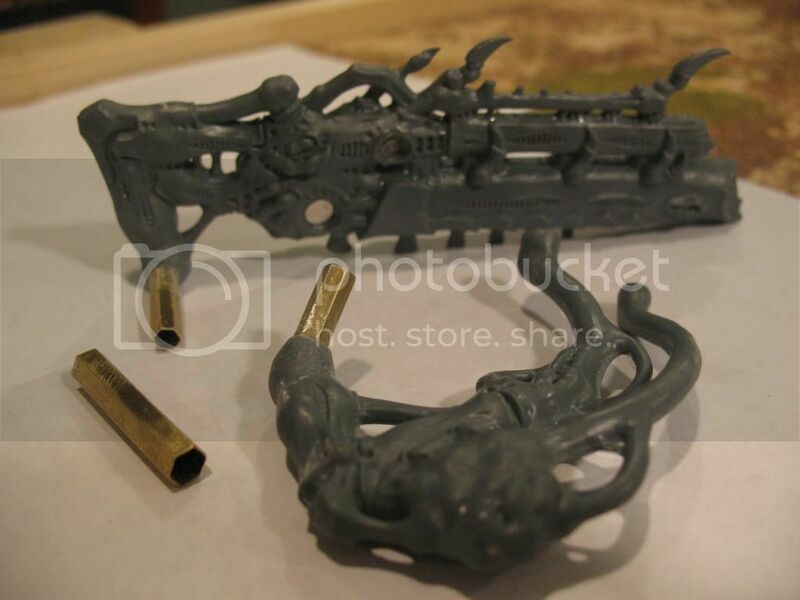 You will also notice the magnets on the Rupture Cannon. This allows the weapons to stick together when mounted and to be taken off easily. Should be self-explanatory. As said before, test fit and test fit again! You want them to line up well, otherwise you will need to use green stuff to fill in gaps. Here are the completed pieces. 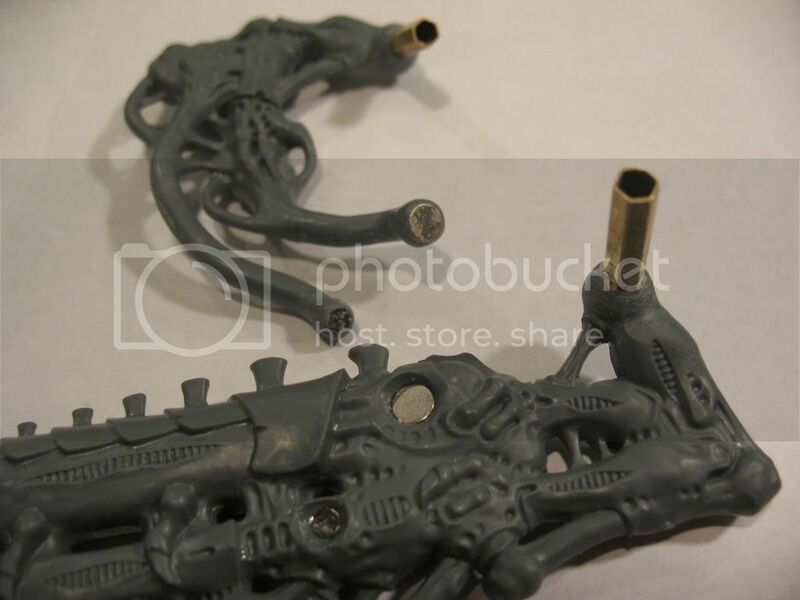 I strongly suggest that you do NOT glue down the brass tubing that is fitted into the torso until you have everything lined up, if you do not you may find your guns not lining up together and/or your gun pointing/sticking into the ground or into the air. This is where patience and test fitting will serve you best. The final assembly. Once you have everything lined up correctly, glue down the torsos brass tubing at the right location. You may want to have your model glued to its base prior to doing this to assist in determining the angle of the weaponry. The rest should be self explanatory. Do the same for the scything talons and other weaponry if you should so desire. Swapping of the heads is simple and can be explained by text. Simply drill a hole in the back of the neck of each head as well as the head socket on the torso. 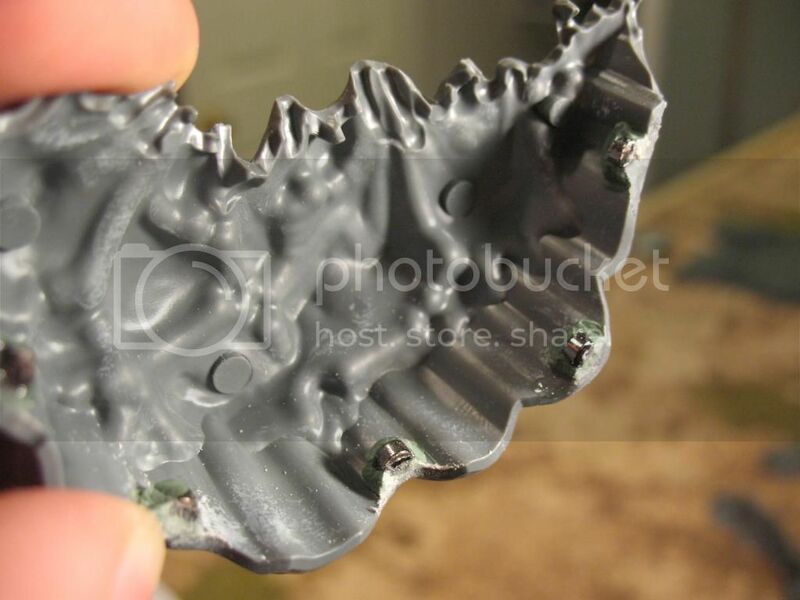 Mount your magnets, with the correct direction in polarity, and you have swappable heads. After all is done, you may now glue down the carapace! 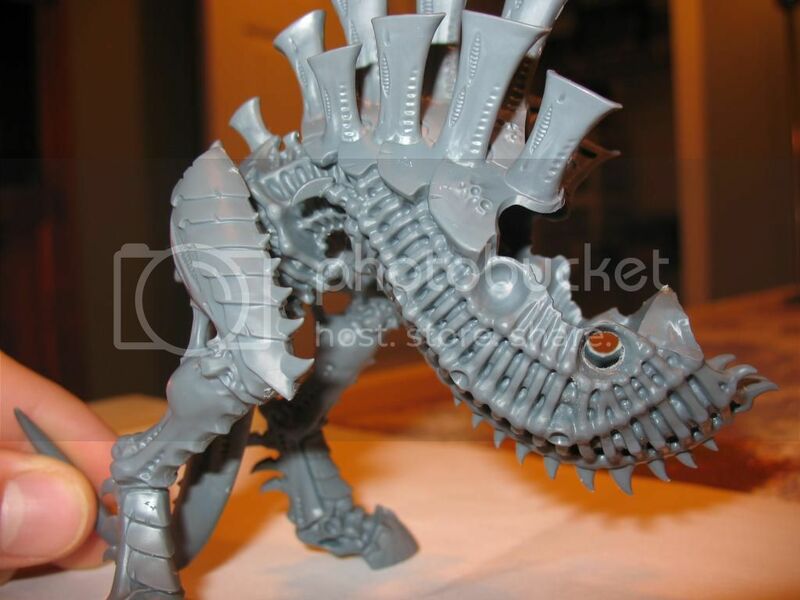 I hope this helps and you get the most out of your Tervigon/Tyrranofex model! Feel free to ask any questions and I will be glad to assist. If you require additional photos I can certainly do that! "No really, I am *the* Great Devourer." - random termagant.